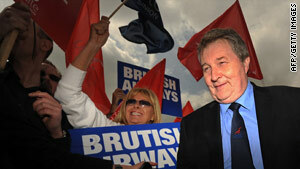 Joint general secretary of the Unite union, Derek Simpson, arrives to address striking British Airways cabin crew. London, England (CNN) -- A second five-day strike by British Airways cabin crew members started Sunday after talks between the union and the airline failed. A five-day strike by the Unite union, which represents most of BA's 15,000 cabin crew members, ended at midnight (7 p.m. ET) Friday. The strike, that began Sunday, is planned for five days. Another five-day strike will begin next Saturday. "The cost to BA of ending the strike is nothing, as cabin crew have offered a pay cut," Unite said Friday. It said the strike so far has cost the airline £84 million ($121.4 million). BA will operate more than 70 percent of its long-haul flights from its main hub at Heathrow airport this week, up from more than 60 percent last week, and more than 55 percent of its short-haul flights from Heathrow, up from more than 50 percent last week, it said. BA said it expects to fly more than 75 percent of its customers who already have reservations during the strike.